Convergence Training are MSHA & mining safety training experts. Click the links below to learn more about how we can help you. Convergence Training: Hello, everybody, and welcome! This is Jeff Dalto, Senior Learning & Development Specialist with Convergence Training, and we’re doing another of our webcast/podcast/audiocast series here. And today we’re over in the world of mining and mining safety. We have a really exciting guest that I’m excited to bring on and we have some interesting things to talk about. So today we have Brianna Eiter, she’s a behavioral research scientist (this is the first time I’m spoken to one of those here) with NIOSH Mining out in Pittsburgh. And she’s here in particular to tell us about hazard identification at mines and a new tool they’ve created at NIOSH Mining called EXAMiner, which provides an online facilitation of training for hazard identification. So, Brianna, with that, hello and how are you today? Brianna Eiter (NIOSH Mining): Hi. I’m good, how are you? Convergence Training: Good. Thanks for joining us, we’re happy to have you. I guess you’re our second NIOSH Mining interviewee, so thanks so much. Side note: Not so long ago we also spoke with Jonisha Pollard of NIOSH Mining about Mining and Ergonomics. Brianna Eiter (NIOSH Mining): Oh, thank you for having me. Convergence Training: So to jump right in, and before we start learning about the hazard ID tool, can you tell first a little about yourself and your professional background, how you wound up at NIOSH Mining, and how you came to be working on this project? Brianna Eiter (NIOSH Mining): Sure. I am a cognitive psychologist by training. I spent several years in academia (I worked at Hofstra University), and my primary research interests are actually in reading, so I studied information processing in adult readers, skilled readers. And after a few years, a couple of life events happened. I chose to move away from New York City, which is where I was living, and I decided I wanted a position that was more applied and that would allow me to take what I know about information processing and use it in a more applied setting. And that’s how I ended up at NIOSH in Pittsburgh–I grew up in Pittsburgh. And I was really interested in the work related to occupational health and safety that NIOSH is tasked with performing. So that’s how I got here. I’ve been here for about eight years, and for the past couple of years I’ve been working on a project focused on hazard recognition-understanding how mine workers recognize hazards in their work environment. And so what we’ve been studying and trying to identify are what are the skills and abilities that mine workers need to have in order to recognize hazards, can we look to experienced workers relative to inexperience workers to find those differences, and use what we’ve learned to help those people who have trouble recognizing hazards to make them better so they perform more like people who are really good at it. So that’s what we’ve been doing for the project I’ve been working on. Convergence Training: Great, that’s a good intro. I really like the focus on hazard identification, and we’ll get into that more shortly while talking about the hazard ID training tool you’ve created and get your thoughts about how people can learn to do that better. I love that your looking and comparing how more experience and more expert miners and hazard identifiers and trying to help those who are less expert at this. Have you heard of a book by Anders Ericsson called Peak about deliberate practice and the development of expertise? Brianna Eiter (NIOSH Mining): Yes. I have heard of it. I have no the opportunity to read it yet, though. Side note: You can read more about deliberate practice and the development of expertise here. But yes, we’re really looking to the experts. Not just the expert mine workers but our safety professionals too. So we spent a lot of time talking to the safety professional community, and I can go a little bit into the laboratory work that we’ve done that preceded the development of the hazard identification tool. But we’re really interested in how those people perform and what differentiates them even the most experienced mine workers, because the short summary of our findings show that the safety professionals even the most experienced mine workers. So there’s something that’s probably both qualitatively and quantitatively different between those two groups of people. And it probably has to do with some of the more hazard-specific experience and hazard-specific training that these two people do or don’t get. That’s what we’re hypothesizing. Convergence Training: Cool. OK, maybe we can pick that up again later, I wrote down a note in case it doesn’t come up again. OK, so that was a great intro about you. Before we dive into hazard ID and the hazard ID tool and everything, can you tell us a little about NIOSH, NIOSH Mining, and the branch of NIOSH Mining you work for there in Pittsburgh? Brianna Eiter (NIOSH Mining): Sure. So NIOSH is the National Institute for Occupational Safety and Health. As an organization, we’re tasked with studying and identifying health and safety concerns that the American worker may encounter, and then working to identify ways to mitigate those circumstances and to give them tools so they can work more healthfully and more safely. I specifically work for NIOSH Mining. We’re tasked with focusing on issues and concerns related to health and safety that are specific to the mining community. And I specifically work for the human factors branch, and we really focus on understanding the mine worker in their work environment, the tasks they perform, and the situations they find themselves in. My project, and the project team I’ve been working with, has focused on hazard recognition and understanding hazard recognition from the mine worker’s perspective. We have other projects ongoing in the branch. One of my colleagues studies lighting and lighting preventions and has worked to try to find ways to use light to improve situational awareness. I have another colleague who is focused on the overall mining organization and understanding how the organization and leadership of the organization affects safety climate. And then most recently we have a pilot project that’s started that is focused on understanding the factors involved in haul-truck accidents. It’s a project that goes along with an initiative from the Mine Safety and Health Administration (MSHA), which is our regulatory body. And for the past couple of years, there have been a lot of fatal accidents associated with haul trucks. So one of my colleagues is working to identify why that is happening to move forward and come up with a plan of action to address some of the critical issues that come about because of the research. And I don’t want to take us to far off path, but that third one in particular, the haul truck project, I think I’m familiar with a little bit. Am I correct that you’ve identified one of the key danger zones as being places of entrance and exits? Brianna Eiter (NIOSH Mining): So, yes. So the current project is just starting. But our previous work, some of the work that Jonisha may have talked to you about, came about because her branch, the workplace health branch, has identified ingress/egress and falls from ingress/egress, as a critical point of concern. So Jonisha and her team are working to determine if it has anything to do with the boots that people are wearing, whether it’s the actual ingress/egress system itself–are there safer ways we can get workers onto and off of this kind of equipment? Because when you have a fairly large haul truck, one of the first things that gets broken is the ladder as people are getting on and off of the equipment. So a lot of times they’re bent, a lot of times pieces are missing. So yes, that’s an area we’re working to address right now. Convergence Training: Alright, cool. So sorry for the divergence. With intros now done, can you tell us more about EXAMiner, the new online hazard ID tool that you guys have created, and kind of explain what it is and maybe give some background about how you developed it? So EXAMiner is software currently available on the NIOSH Mining website. You save it to your computer. Once it’s there, it will always be there, and you can update it any time we roll out new updates. Anything you create while you’re using it, even if you delete and re-install, all that stuff will be saved to your computer. A little background as to how we got here, and then I can tell you more specifically about EXAMiner. We started this hazard recognition work a couple of years ago in the laboratory. So the development of the tool, and most everything we’ve incorporated into EXAMiner, is based on research we recently completed. We have a lab on site, it’s called the Virtual Immersion and Simulation Laboratory (we refer to it as the “VISLab”). It’s a virtual-reality center. And we have a theater, a circular theater, 360 degrees, 10-foot-high screens, and we created pictures to use in this theater. We had established a relationship with a mining company, they kindly allowed us to come onto their site and take pictures. So our goal was to take pictures that represented work environments, tasks, and different situations that mine workers might find themselves in throughout the day. And these pictures include hazards–hazards that we staged, hazards that we created using Photoshop, hazards we enhanced using Photoshop–our goal was to make them as realistic as possible. And they were of locations that were typical of a surface/stone mine. So that’s where all of our pictures were taken. These are pictures of a shop, of a pit, of a plant, of haul roads and different types of roadways. Overall, we have 32 pictures. We brought workers in to the lab environment and we just asked them to search the pictures and find the hazards. Our participants included experienced mine workers, inexperienced mine workers (workers with less than 2 years of experience at a mine site), we had student volunteers (they’re kind of our baseline group, so they’re knowledgeable of mining but don’t have the practical experience of mining that even a non-experienced miner would have), and then we had safety professionals. We had them search through the pictures, trying to find as many hazards as possible. As they were doing this, they had a little button, and when they say something, they pressed the button. We also monitored their eye movements, so we recorded where they were looking and when they were looking as they were doing this. So this is the “search” portion of the task. After, we took notes, we took down all of our equipment, and then we sat down and we did a fairly extensive debrief. So we talked to people about what they found, what they didn’t find, and then we collected risk assessment scores for all of the hazards that we included in our pictures. So you don’t necessarily need that in order to have a good training experience. So we looked at what we had, and we identified from the lab study what we wanted to focus on–what we thought were critical aspects of the study that should be included in training software. And then we looked at the literature (the training literature, the cognition literature) and we wanted to identify competencies we could potentially affect change to and that also we could incorporate change into within the software. And that’s how EXAMiner came about. So the software gives mine workers the ability to practice searching for hazards in as realistic an environment as possible. So these are all pictures that are true to life. They were all taken at a mine site, they’ve all been vetted, we’ve had people onsite and people offsite review all of the pictures. We’ve had people tell us that the hazards are real and that people should be able to find them. So we have the ability to practice, and then we made sure to build in an opportunity to debrief, because during training, it’s always critical to debrief. So we include for mine workers and trainers information about what people found and didn’t find, we provide information about the number of mouse clicks people make as they’re searching through the scene, we provide information about how much time it took you to perform the task, and you can use all of this information in your training sessions to reinforce various points. So, maybe you finished this really, really quickly, but you missed a whole bunch of hazards. Maybe you need to slow down a little bit, and here is some evidence that slowing down might help. And then, during the debrief, we worked to include a bunch of supplemental materials. And so for every hazard that we include, where possible, we provide a link to the Code of Federal Regulations (CFR), which is used when MSHA goes out to do inspections. So we provide the trainer with a link to that information in the CFR. We looked at the MSHA website, we looked at the NIOSH website, we looked at the OSHA website, and we tried to pull other materials to reinforce training about different hazards that are in the software. We try to do as much legwork as possible to make these as useful as possible for people. So the software has 32 pictures, and within those 32 pictures there are 106 hazards (note: when downloaded the software includes 31 of these 32 photos). We tried to make the hazards as varied as possible. So they vary in risk, they vary in size, some of them are really big (so for example it’s a haul truck with a big issue on it), or there’s something set in the corner, because not all hazards are going to be looking you right in the face when you’re out searching. We tried to vary where they were located, whether there’s a person involved or not a person involved, so that when people are searching they’re not just looking for the person to make sure they’re not doing something wrong. So then this is what the software entails and then, one final point: I think one of the key points about the software is it gives trainers flexibility. So you can create your own materials using what we’ve developed. So, we have these 34 pictures, and you can create training materials based on those 34 pictures. And you can probably use those for several training classes. Or, and this I think is one of the key aspects of the software, it gives you the opportunity to upload your own pictures. So you can create your own site-specific training materials, which can actually make this useful not just for the mining industry, but across all industries. And then it becomes a tool that is useful across time. So if you have a camera–and really what we’re teaching and trying to tell people to use is their phones, because everybody’s phone has a camera on it–if you have a phone and you can use that to take a picture, you can upload that into the software and create your own training materials. And the great part about it is that it’s free, because it’s available on our website and all you have to do is download it. Side note: download a copy of EXAMiner here. Convergence Training: Great, and definitely before this is over, we’ll discuss where you can download it (but just check out that link immediately above to download). I have a couple of questions. Maybe kind of going in reverse order, because I think it’s cool that it can be customized. So it’s great that people can load their own photos in, and I’m assuming those pictures will include hazards. Is there some programming they will have to do within the software to identify “hazard 1” and “hazard 2” or something like that in addition to just putting the photos in? Brianna Eiter (NIOSH Mining): All of that is done through the software. There’s a section of the software that gives you the ability to upload your pictures. And then you have the ability to name your hazard, then define where that hazard is, at which point it becomes numbered. And then you can add your own supplemental material, so if you what your workers to know that this hazard is associated with this point of a CFR, you can put that information there. And based on preliminary feedback, we’ve also included the ability to add a hyperlink, so if you want to send somebody out to look for additional information, you can hyperlink and if you have access to the internet, you’ll be able to open that information as well. And then you just hit save, and all of that is saved as a part of the picture. So you enter your photos, and then there’s a little user interface that allows you to identify the hazards and enter information about the different hazards in the photos? Brianna Eiter (NIOSH Mining): Yep. So you also had nice feedback from some of the people who took this, they said it was some of the best training they ever took. I imagine you have some ideas about why that is, why they liked it. Can you share any ideas about that? Why was this so effective and so popular? Brianna Eiter (NIOSH Mining): So–a couple of points. And this is not just from now, but we’ve been out and about, we’ve given people the software, we’re gone out and observed people using it. And so some of the early feedback that we got from the lab study is that for new mine workers–typically, this is not always the case–but, and one of the companies we were working with, their new employees always start in the mill. This is where all of the people who are coming in are coming in through. So everybody gets funneled into the mill, they do some job, probably some sort of maintenance/repair-type job in the mill, and then if they bid out jobs in other locations around the mine site, often times where they’re going to wind up is in the pit. And they have no way, really, of demonstrating hazards in the pit to somebody who spends most of their time in some other location. So that company really likes that these workers are coming in, and they’re being exposed to hazards and hazardous situations in a somewhat-realistic environment (because these are true-to-life pictures) and they can get the experience without actually being there. So they liked that idea of that exposure. And other people that we worked with really liked the engagement that the software brings to their training classes. So, using it in their training classes, from what we’ve seen, people don’t just interact during the debrief, which is really where you’d expect people to begin to talk. But during the search task, depending on how you use the software during the training session, there’s actually a lot of debates…we’ve seen a lot of debates, and a lot of discussions. One class that we observed, everybody got up and they were all standing around the screen, pointing at things and talking about different aspects of a scene that was going on. For the most part, that’s what we’ve experienced when people use this, and that’s what we’re getting reports of how and why people use the software. Because it’s sort of forcing the miners to talk about things that they may not have talked about in the past, because they can actually visualize it because it’s right on the screen in front of them. Convergence Training: That’s great. So it’s active, it’s collaborative, and it’s creating conversations that weren’t happening elsewhere. My other follow-up question, and this is a two-parter, am I correct there are four training groups: students, inexperienced miners, experienced miners, and safety professionals? Brianna Eiter (NIOSH Mining): Yes. Convergence Training: And you said the safety professionals out-performed everybody, even the experienced miners, even if the safety professionals didn’t have a mining background. Brianna Eiter (NIOSH Mining): Well, they were all MINING safety professionals. Everyone was from the mining industry. Even the students were enrolled in a mining engineering program. That was our one criteria for students. So those mining safety professionals who out-performed the others, what is it that you think prepared them or allowed them to perform so well? Brianna Eiter (NIOSH Mining): So, I think that…well, a majority of them did have a lot of actual experience. So they had been in the industry for a really long time. But that was also true for the experienced mine workers. It seems that the critical difference between our safety professionals and the mine workers was the different type of training experience they reported. So either it was hazard-specific training experience, or more risk-based training experience. Sometimes some of our safety professionals were actually trainers. So they were the people who were teaching the mine workers, and I take refreshers every year, so one of our participants was actually someone who was an annual-refresher instructor. So I think some of those experiences really differentiates the mining safety professionals from even the experienced mine workers. OK, so, you identified this online hazard ID tool. In the real world, what are some of the most common hazards that miners face? Brianna Eiter (NIOSH Mining): So, some of the most common hazards miners face are things related to handling materials, and a lot of that stuff is related to things like maintenance repair, shoveling, lifting things like rollers if you’re doing belt maintenance…so I think a lot of hazards like those are associated with deciding which tool to use, using the tool in the correct way, using correct lifting techniques and lifting posture when you’re doing some of these tasks. There are also a lot of hazards associated with hand tools. So using hand tools correctly, making sure you’re using PPE appropriately if you’re doing something like hammering, so if you hammer and something happens to break off, you don’t get hit in the face with debris. And then, of course, the ever-prevalent slip/trip/fall hazards. There are a lot of falls related to build up of material on a walkway, or things like corroded or degraded material on catwalks, conditions brought on by weather–so mud, or ice–things like that. So those are really the most prevalent hazard categories. And as you look through EXAMiner, and you look at the hazards we included, we definitely looked at the data–the MSHA data, the non-fatals, to help us kind of hone in on which hazards to include. And there are several hazards associated with each of those hazard categories. Really, they’re accident categories, they just happen to have hazards associated with them. OK, and that sets me up for my next questions. If that’s a group of the most common hazards out there, and you mentioned you looked at non-fatals while researching those, within hazards at a mine site, are there some in particular you’ve identified as most often contributing to serious injuries or fatalities? So we also incorporated some of those as well. The hazards that are most likely to lead to fatal injuries are falls, so falls from heights; then hazards associated with things like electricity. So, it’s interesting. Throughout the course of this project, we focused on the lab work we’ve been doing. And one of my colleagues and I, kind of in the middle of the project, we did a group of interviews with safety professionals, because part of what drove this research program was that there was going to be a rule change affecting how people performed workplace examinations. So, when do you do the workplace exam? When do you go out and inspect your environment? How do you keep track of that information? What’s the required record keeping? All of that. We went out and talked to some safety professionals about how their workers did their workplace exams, what they look for, and this one idea kept popping up as people were talking: the idea of imminent danger. So these are hazards that, if present, are likely to lead to serious and fatal injuries. So this idea is really associated with the workplace exam. Because if it’s one of those hazards then you really need to stop work. And in talking with safety professionals, we were interested in understanding how people know that something IS a hazard that is imminent danger. Like, what is it about this that calls out to you “Stop!” Where’s the threshold, right? So in answering this, and it’s funny, because there’s no real set answer, and a lot of what we got back was “Well, if you see it, you’ll just know.” So my colleagues were working around on the MSHA website, and–lo and behold–he found all of the imminent danger orders that were there. So there’s a spreadsheet that exists that has all of that information in it, so we were beginning to analyze all of this data. And this idea, that if you see it you’ll know it, you’d be surprised how many imminent danger orders are issued, and there’s a lot of them, and a lot of them are actually associated with falls and fall protection. And so there seems to be a lot of issues around knowing when to use it (fall protection), using it, understanding whether there are flaws with your fall protection. So there seems to be a gray area around the use of fall protection, and that is one of the categories that leads to a lot of fatalities. And also a lot of imminent danger orders. A lot of people just don’t know when to use their fall protection, how to use it, if they’re working in an area that’s not suitable for tying off. So we’re currently working on a paper to better understand that process. I think it’s a really interesting question: what is it about that that makes that situation imminent danger? Convergence Training: Those are two good pieces of information. One, the emphasis on fall protection. I’ll be tracking that at NIOSH Mining now that I’m aware of it. But two, this issue of what makes a hazard an imminent hazard. Because hazards normally don’t come with a sign that says “I am imminent.” Especially since there’s no clear definition, and I’ll bet you’ve probably noticed that a lot of times, with this whole “you’ll know it when you see it” thing, that tends to come up retroactively a lot of times during an incident investigation, and when you say that you feel like well, the person should have known it. But it might not have been as obvious at the time within the actual working context as it appeared retroactively, but because that’s the way the dominos fell, then it seems inevitable that it was imminent, but maybe it wasn’t quite so obvious at the time. Alright, those are good answers, thanks. So you’ve got this hazard ID training tool, and people can use it as a stand-alone training tool. And you’ve already explained that you built some more materials directly into the hazard ID tool. 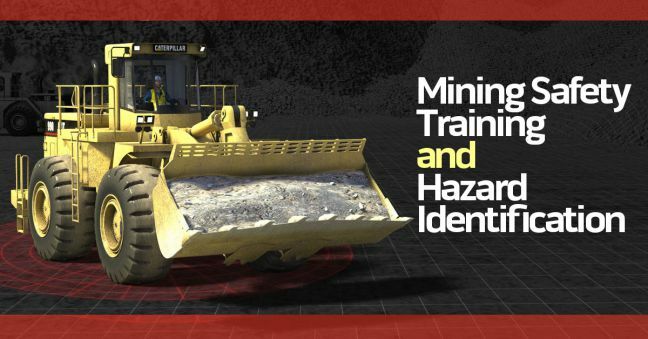 But do you have any thoughts about how people should use your hazard ID training tool along with other resources, kind of creating a blended learning solution for hazard identification training? So, first off, there’s no right or wrong way to use it, right? So you can use it, you can customize it. We’ve seen people use EXAMiner a couple of different ways. One way people have been using it in more of a blended way is they’ve been using EXAMiner as a means to evaluate a whole day of learning. So if you’re doing your annual refresher training, you have eight hours with your workers to complete your annual refresher training. So we’ve seen people use it at the very end of the day–set aside 45 minutes or so–and you can use it as an opportunity for miners to put what they’ve learned into practice or to evaluate what people have learned, what they’ve learned, and whether they’ve drawn something new from whatever you’re refreshing with them at the end of the day. So that’s one way we’ve seen people use it–as a means to evaluate what people have learned at the end of the day. One way I haven’t seen yet, but I can envision people using it this way, is…part of EXAMiner is also a set of what we call NIOSH scenarios. So we’ve gone through all of the materials that we have included, and there are six or seven NIOSH scenarios included. One is for electricity, one is slips/trips/falls, one is for mobile haulage, there’s a ground control scenario…and what we have done is we’ve pooled the pictures that have hazards associated with electricity, hazards associated with ground control, and we put them in one location–they’re in a scenario. So if you have a PowerPoint or some learning activity that you’ve created, and you really want to focus on electricity for the day, you can use that scenario, and then you can use the NIOSH module within EXAMiner to supplement what it is that your workers are learning. You can also use that as a way to evaluate if they’ve learned something from what it is that you presented. And the way that we structured those scenarios, the instructions are to focus only on those type of hazards, so for example searching only for electrical hazards. And then when you get to the debrief, you are given information just specific to electrical hazards. So you get hazards related to electricity, and then all of the debrief activities that are focused specifically on supplementing and reinforcing your knowledge of electrical hazards. And so there are a couple of those in there. Then we’ve also developed what we call new miner scenarios. So we went through all of our data, and we identified the hazards that were missed most often by the student participants, so this is relative to the safety professionals and what they missed. So we looked for hazards where there was a 25 percent difference in identification between the two groups. And you’d be surprised. There were a lot of hazards, I think there were maybe 30 hazards that fell into that category. What we did was we created those scenarios based on locations, so there’s a new miner scenario for the pit, for the plant, for the shop, and for the roadway, and those scenarios have the hazards that were missed most often. We figure if there’s a place to start with new miners, it’s with the hazards that they are missing most often. And so we can sort of get a jump start on that. Actually, electrical hazards were missed a lot by the new miners. So for example you can get a let up on better understanding of electrical hazards. With ground control hazards, people seem to get much better at recognizing when a crack in a highwall is hazardous, when there are issues related to berming, as they become more experienced. Exposure seems to really help with that stuff. Convergence Training: So, in your standard set of photos, the one we started talking about with I think 30-some photos and 100-some hazards: I know people vary, but how long does it take for an average person to get through that? Brianna Eiter (NIOSH Mining): In the study? Brianna Eiter (NIOSH Mining): A little over an hour? Brianna Eiter (NIOSH Mining): So, the thing to keep in mind for the study is that you could max out at two minutes. So, we gave every person who participated two minutes to search through each picture, and if you used up all of the two minutes, you then went on to the next picture. You could be in there forever if there wasn’t a maximum time cap. Convergence Training: So if someone wanted to, they could use this a little bit all throughout the year for refresher training as well, using it for spaced practice and spaced learning? What Should Miners Do When They Identify a Hazard at Work? So jumping from that topic, which was how to use this as a training tool, what can you tell us about what miners should do when they’re on the job site at a mine and they identify a hazard? Brianna Eiter (NIOSH Mining): So I think that really depends on the type of hazards you encounter. So if you come across something where you have the knowledge, skills, and abilities to handle, then I think you should go for it (and remove or control the hazard). So if there’s a build-up of material on the catwalk, and there’s a shovel that’s readily handy, go take care of that. If you encounter something that is more challenging, that requires more than one person to mitigate, that is outside of your area of expertise…so, if you’re not an electrician and you encounter something that looks like it could be related to electricity, I think the first step (and this could also depend on SOP at your mine site) is definitely going to be to barricade the area off, so that nobody else at your workplace is going to be exposed to the hazard, and then you’re definitely going to want to alert your supervisor so you can bring in a second set of eyes to help either make a decision, or that person may be the expert in that area, and they’ll know who to call, who to notify, what parts and tools are needed, all of stuff that’s necessary to mitigate the hazard. The other piece of that, especially in reference to the workplace exam I mentioned a few miners ago, any hazard left unmitigated, especially during the performance of a workplace exam, should be noted on the workplace examination form. And that form will be left out on the day that you reported that hazard. It should be left out, maintained out, so that when MSHA comes in, they know you recognize this is a hazard, it’s a hazardous situation, and that you’re working to mitigate it, especially if it’s something that’s going to require parts that you don’t have, so you have to order something. But as soon as you mitigate, you should definitely make sure to mark that on the form, and then you can file that away for record keeping purposes. Convergence Training: Alright, thank you. So, I know this is at the website. Do you know the URL where people can go to download it and then, in addition to that, is there anything else that we should have talked about or that I should have asked you about this tool? Brianna Eiter (NIOSH Mining): Here’s the URL. And beyond that, my big takeaway for EXAMiner is that it’s a tool that was developed based on work we were doing for mine workers in the mining industry. But I think the really cool feature of the software is that it’s customizable, so you can create site-specific materials regardless of whether you work in the mining industry or not. Anybody can use it. I think that’s the real selling feature of the software. So when you look at it, when you get it, there’s a picture of a pit, but don’t be deterred if you work in oil and gas–you can definitely use EXAMiner. If you work in the steel industry, EXAMiner is for you. So I think that’s the real selling feature of it. All industries have hazards. All workers must be able to recognize those hazards. It’s really important that trainers are able to help their mine workers or just their workers practice to be able to get better at finding those things, because if you don’t, they can lead to accidents and injuries. And the second piece is, while I said that our safety professionals were much better that our student population, there is always room for improvement and for people to learn more. Our safety professionals scored something like 65%. So there’s still room for improvement even for that group of people as well as the new folks. And I like the fact that EXAMiner can be used for safety in any industry. And for those who are listening, when Brianna is talking about “selling points” of EXAMiner, she’s talking about buying in emotionally and using it, because it’s free. So you don’t have to buy it. Are you going to be demonstrating this, or will anyone else from NIOSH Mining, at the upcoming MSHA TRAM conference in the fall? Brianna Eiter (NIOSH Mining): We should be. We’re kind of out and about right now, demonstrating EXAMiner. I don’t know if you’ve ever been to the Holmes Association, but one of my colleagues will be presenting and demonstrating EXAMiner there, we go to mine health and safety conferences across the US, so we’ll in Dallas at the South Central Mining Safety and Health Conference in the spring, I’m going to be in Charleston, West Virginia in a couple of weeks talking to the West Virginia Coal Mining Institute, and then we also participate in Spring Thaws, when possible, so one of my colleagues will be in Kansas helping out with the Spring Thaw and demonstrating EXAMiner there. So, we’re out, we’re about, and we’re trying to demonstrate and give information about how to use EXAMiner incorporated into your current training plan. For this EXAMiner project, is that it? Is it released and then done? Or will there be future phases of the project? What’s coming next with that? Brianna Eiter (NIOSH Mining): So we’re in the final year of the current project. We have additional materials associated with EXAMiner that we’re working to roll out the coming year. Ultimately, we envision a version 2. That’s where we’re moving. But if you look at our website, it’s the beta version of the software. We’re still collecting reviews, we’re still collecting feedback, and once we finalize EXAMiner for the website, hopefully we’ll move forward with our second version that has additional features that some of our users have indicated that would make it even more useful. Brianna Eiter (NIOSH Mining): So, I will likely be involved in moving forward with version 2, and then in the fall…we’re currently in our “next project” cycle for proposals, so nothing is set in stone just yet…but I’m liking to start working on a project that is geared toward identifying interventions and practices to improve mine worker cognitive maps. So this would be a follow-up to some work that my colleagues completed that was focused on understanding self-escape and the competencies associated with self-escape during a mine emergency. And so that’s likely where I”ll be moving some of my efforts in the fall. Convergence Training: That sounds interesting. I look forward to following you on that. Well cool. Good luck with that, thank you for your time here. For everyone out there, this is Brianna Eiter with NIOSH Mining out in Pittsburgh. The tool is called EXAMiner–go check it out and download it as part of your mining safety training or, as we learned, for other hazard ID purposes that are not industry specific. And Brianna, thank you very much for your time, and we look forward to keeping in touch on this. Brianna Eiter (NIOSH Mining): Thank you. Thanks for having me. And here’s the video of this discussion if you’d rather watch and listen instead of read. Thanks again to Brianna and everyone at NIOSH Mining and be sure to download their EXAMiner hazard identification training tool. Stay tuned for similar topics, including hopefully more contributions from the good people at NIOSH Mining. 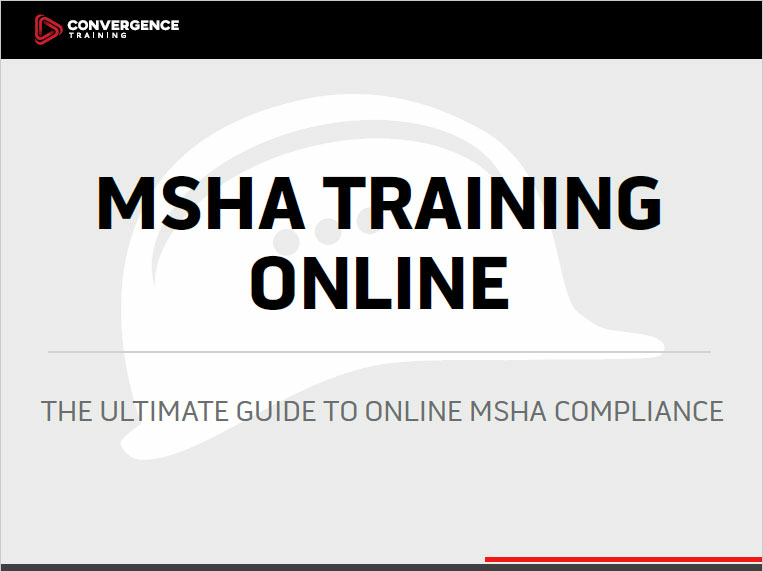 And hey, before you leave, why not download the free guide to online training for MSHA compliance, below?